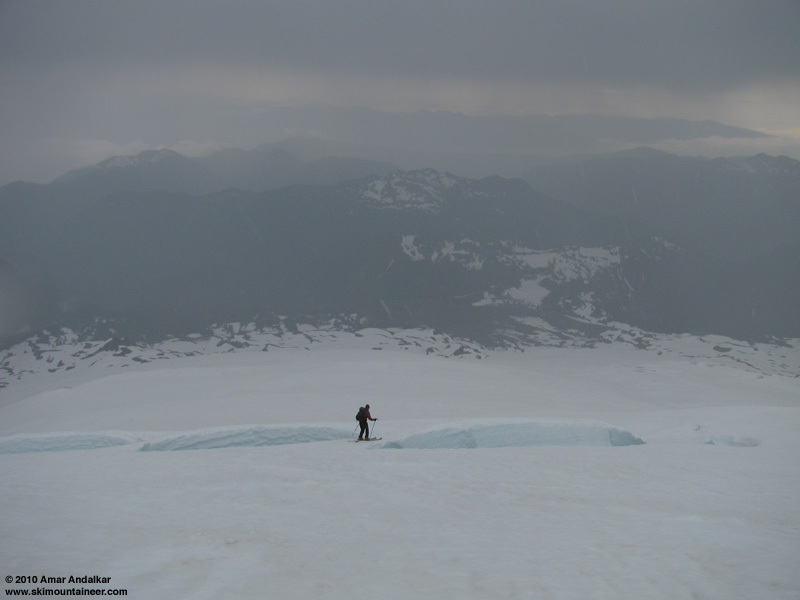 Lots of recent Squak Glacier TRs, so not too much new to add, but today several of us had the unique experience of "enjoying" a snowstorm on July 31. Looking down the Roman Wall at falling SNOW, 12:40pm on July 31. Left the trailhead at 7:30am (perhaps an hour too late! ), lots of mosquitoes at the trailhead, and also near 5000 ft. Current approach hint: stay on the Scott Paul Trail as it switchbacks left at the 4600 ft saddle (don't follow the steep narrow wet climbers path straight up the ridge like we did). Continue on trail for another 1/2 to 3/4 mile to reach a finger of snow near 4900 ft, and another finger of snow hits the trail just after that near 5000 ft. 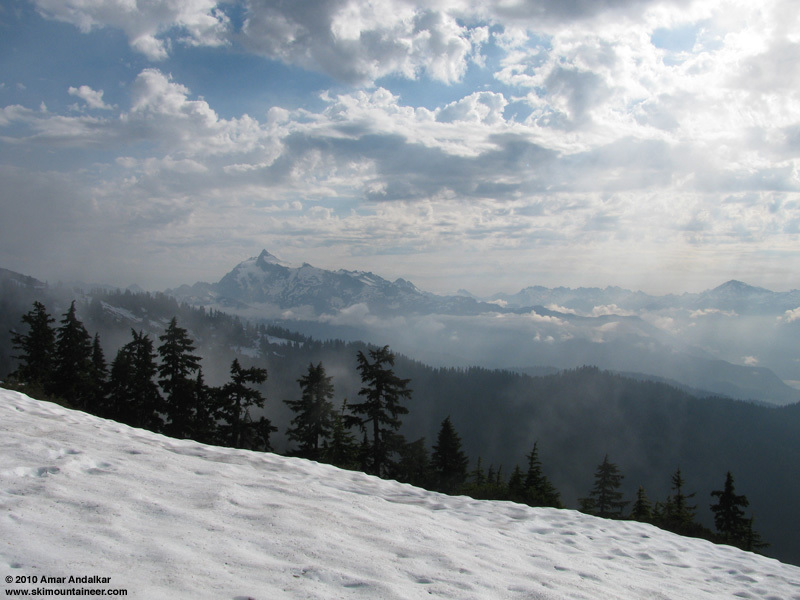 Either one still offers continuous snow all the way to the summit, but things are melting out fast below 6000 ft.
Mount Shuksan with ethereal clouds and sunbeams. 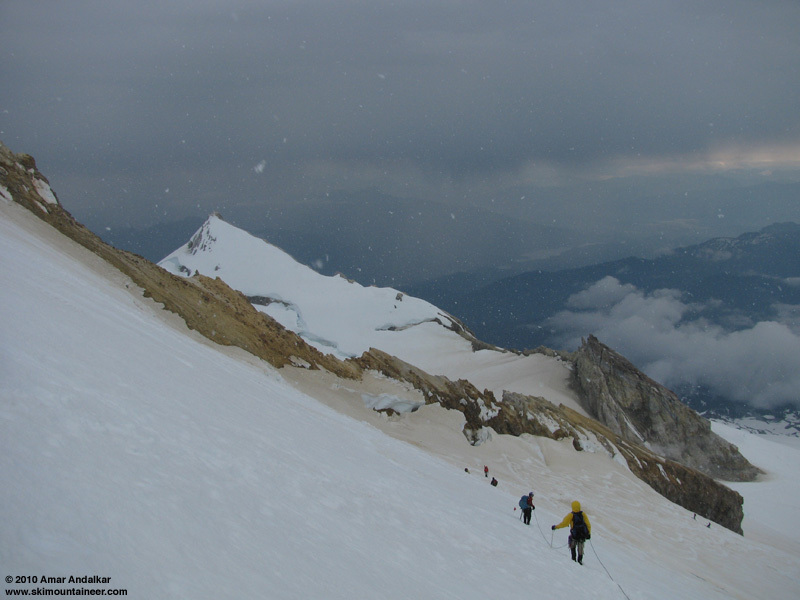 Partly cloudy during the ascent, and we knew that the forecast called for a "chance of thunderstorms".� Numerous showers (virga) were already visible in the distance to the south throughout the morning. Just as we reached the Sherman Crater rim at 9700 ft around noon, ominous darker clouds began closing in rapidly from the east. A few scattered raindrops were felt, then snow began in earnest as we skinned above 10000 ft up the Roman Wall. Summit plans were abandoned and we turned around atop the Roman Wall near 10600 ft, skiing down on decent corn despite the freezing temps and falling snow, avoiding several painfully slow rope teams descending the face on foot. Sherman Peak through the snowstorm from atop the Roman Wall. The snow changed to heavy rain below 10000 ft, and despite a thorough soaking, the ski conditions remained quite good during the rest of the very rainy descent, with wet corn snow higher on the glacier and sloppy carveable suncups down low. Not a bad day at all, about 7300 ft of gain for 5600 vert of snowy and rainy corn skiing. Quite a way to end an amazing month of July, probably the best July for ski mountaineering conditions in the Pacific Northwest since at least 1999. Crossing the crux crevasse in the pouring rain. Tomorrow will be 2m 39s shorter. 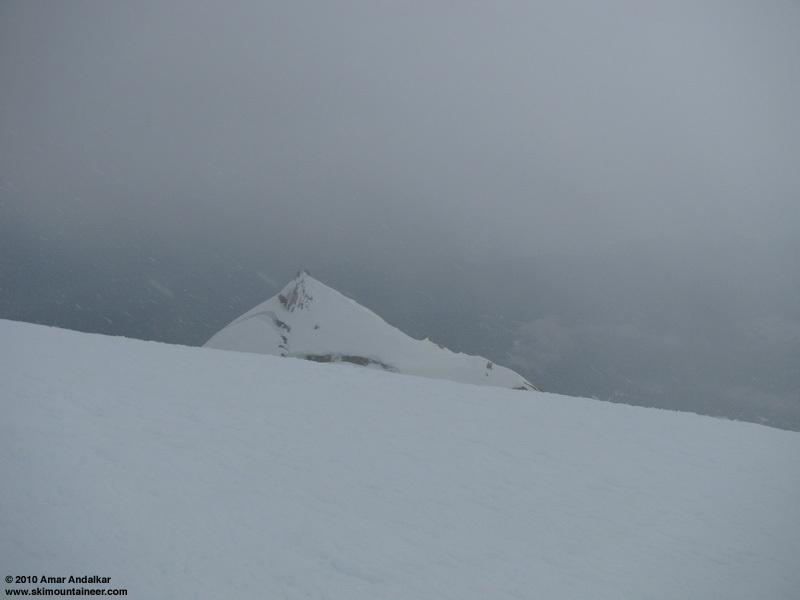 The snow on July 31st was great and the visibility held!� The rain wasn't even that bad.� Kept things interesting. The buzzing (clicking) in my ski tips and then my poles while they were on my pack at the top of the Roman Wall said it was time to get down fast. Luckily no lightning ever came. I have heard of it, but that was the first time I have experienced it. We were on Mt. Washington a few years ago. Lightning and thunder were 12-20 miles away but at the summit the static electricity was almost painful. Photo of my daughter with her pigtail electrified. I'm sure we stayed longer than we should have. freightrainer, that photo of your daughter looks like a science experiment. That is crazy.